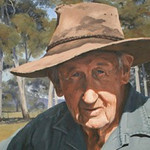 Chris Bird passed away at 3 pm on Monday 8th April, 2013, in Lithgow Hospital, aged 84. He never regained consciousness after undergoing heart surgery on 22nd March. A funeral service was held for Chris at St John’s Anglican Church in Hartley on Friday, 12th April at 12 noon, possibly the most well-attended funeral in the history of Hartley. An estimated 300 friends, family and well-wishers came from far and wide came to farewell this gentle, well-loved icon of the Valley. They can be viewed here: Eulogy to Chris Bird 2013. Meanwhile, here is a photographic tribute to Chris from the last 14 years of his life. By clicking on the above portrait of Chris, by Garry Pettitt, you will access a gallery of photos of Chris with his friends in Hartley.